News | The astonishing MASTER EDITION of Alan Moore & Eddie Campbell's FROM HELL approaches issue #2! 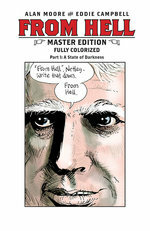 The astonishing MASTER EDITION of Alan Moore & Eddie Campbell's FROM HELL approaches issue #2! Check out 4 preview pages now and pre-order at your favorite comic shop for release in NOVEMBER!